Retribution is in pretty fine shape in Warlords Season 2. Read on and then kill the enemy! Retribution Paladins have a fair amount of variation depending on what you want to do. For example, whether your just doing damage or you also assist in heals and support. This page assume that you primarily want to smash the faces of the opposition. Note: Some aspects of this guide may not apply to your character until higher level. If are interested in getting your character to max level quickly, take a look at this leveling guide. Talents and glyphs are easily changed to suit the current fight. The following build is for general PVP, if you’re doing something specific (eg; Dueling or 40 man BGs) then you might want to change things to suit. Talent descriptions are below the image, our picks are checked. Sprint: Speed of light’s CD is too long, though it’s otherwise a nice sprint. Judge: Long arm of the Law – You get a speed boost every time you hit with your Judgment, with its brutal 6 second cooldown, which makes it great catching up with would be kiters. Giving how much you’re using Judgment anyway there is really no reason not to take this, especially if you’re taking the level 100 Empowered Seals, which give you more reason to be highly Judgmental. Then throw in a Glyph of Burden of Guilt which slows the opponent and catching him should be easier. Passive: Pursuit is too slow for most PvP. Stun: Fist of Justice, because stuns are better than snares. The short cooldown is nice, as is the range. Sleep: Repentance has a cast time, which makes it harder to use in arena, and the sleep is too easily broken by DOTs and any other damage flying about. Area stun: Blinding Light might be better if you like to jump into the middle of big fights (such as in some BGs) as it’s an area stun. The 2 minute cooldown makes it much less useful, generally, than Fist. FoL heal: Selfless Healer is the go-to talent here, assuming you’re using that heal. Get three stacks and you have a nearly free Flash of Light. If you have various buffs up (eg: your wings) then the heal is even better. Not that this effect can be purged. Sacred Shield is a better choice if that’s a concern. WoG heal: Eternal Flame is just a weaker heal than Selfless, so is pretty useless. It also uses HP better spent on damage. Shield: Sacred Shield is decent, but it’s an extra button, and action, that you have to take and while it’s not better than Selfless Healer, it’s mechanics make it easier to use in some ways. If purged only the 6 second absorb goes away, not the 30 second effect. DOTs: Hand of Purity is good if you know that you’re going to be fighting opponents that use a lot of DoTs, such as Unholy DKs and Affliction ‘locks. Cooldowns: Unbreakable Spirit now reduces the cooldown on Divine Shield, Divine Protection, and Lay on Hands by 50%. Best used if you figure that you’ll be trained hard. If your team has the equivalent of your hand effects then this can be a good choice. Hands: Clemency just gives you a lot more versatility with your various Hand spells than otherwise. Burst: Holy Avenger is just a really nice burst cooldown and it’s predictable. Really adds to yoiur finishers. You have it when you want it. You can also use it to throw out a lot of Word of Glories, if you do such things. Wrath: Sanctified Wrath makes your wings (Avenging Wrath) last 50% longer and reduces the cooldown of your Hammer of Wrath to 3 seconds. Which pretty much means you can spam it at low health targets and alternate it with Templar’s Verdict (Final Wrath.) Works well with your Empower Seals talent, where Judging Truth gives you even more H of Wrath damage. Proc: Divine Purpose is a nice buff and it will do as much damage over a long fight, but it’s a random proc. Better for pvE. Focus: Holy Prism has decent utility and has a short CD. It’s easy to work into your rotation and it can break the stealth of the Rogue behind you. Nice if targets won’t live long. 20 second cooldown gives more flexibility than Execution Sentence. 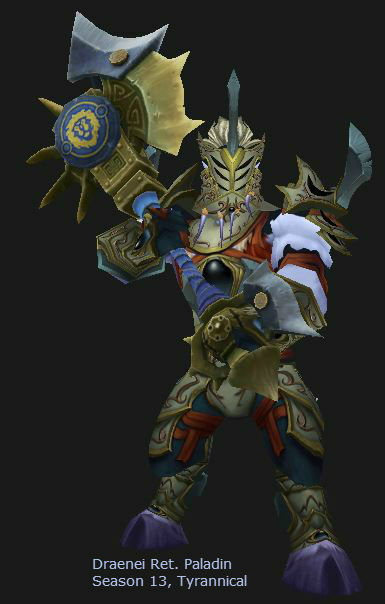 Area: Light’s Hammer is more of a PvE talent and it’s easy for the opposition to move away. Drop the Hammer: Execution Sentence makes it pretty obvious just who you’re attacking, and gives them time to react (dispel,) which is not so desirable. It’s nice damage and can be used as a heal when dropped on yourself or an ally. Pretty good at causing enemy cooldowns. 1 min cooldown. CC the dispeller and then drop the hammer. More effects: Empowered Seals: Your Seals also cause your Judgment to provide additional effects. This restores some effects that were removed from Judgment awhile back. Each effect lasts 20 seconds and Judgment has that 6 second cooldown, so you’ll be able to keep this buff up just about 100% of the time. If you’re quick at changing seals you will be able to have more than one of these buffs at one time. Two should be easy. It’s more complicated than Final Verdict, but there’s more upside, such as having improved Haste and Attack Power and extra healing. J. of Truth increases Attack Power. Buff: Seraphim: All of your secondary stats (Haste, Crit, Mastery, MultiStrike, Versatility) get increased by 30% for 15 seconds, with a 30 second cooldown, which is a nice burst with about 50% uptime (depending on the fight and your usage.) Still, you’re spending 5 HP to fire it off. Smack! Final Verdict: A mighty strike, doing all of the damage as Holy, which lets it bypass some defenses. It also increases the radius and damage of your next Divine Storm, both by 100%. Replaces Templar’s Verdict and gives it a 10 yard range. Pure, raw, damage on a strike that you’re doing anyway and your Mastery just increases the Holy damage part. Goes very will with your Holy Avenger talent. Major: The first three are the most generally useful, but the others have their places. You can easily swap glyphs, even at the start of an arena, so plan on doing just that. Note that some sets of glyphs are exclusive with one another, which means that you can only lead one of them. As an example are the three Judgment glyphs: Judgement, Double Jeopardy, and Burden of Guilt. You can use only one at a time. The first two are pretty important. Damage: Glyph of Templar’s Verdict – 10% damage reduction from TV or Exoercism, up most of the time since you’ll be TVing and Exorcising as much as possible. Less CC: Glyph of Hand of Freedom – reduces the duration of CCs on your allies or yourself as well reducing incoming CC for 4 seconds. A bit redundant with the diminishing returns mechanic, but it has its uses. Glyph of Judgment for the 40 yard range. Glyph of Double Jeopardy – adds damage to your second Judgment, used on a second opponent. For example, swat a totem with the first and swat the Shaman with the second. Glyph of Divine Shield heals you for each harmful effect removed. Glyph of Harsh Words – allows your Word of Glory to be used as ranged damage. Glyph of Divine Protection – for those times when you need a little more physical damage reduction. Glyph of Burden of Guilt. The Glyph of Burden of Guilt causes Judgment to reduce the target’s movement speed by 50% for 2 seconds. Combined with the Long Arm of the Law talent there will be no escaping you. Glyph of Merciful Wrath for more frequent, but less powerful, Avenging Wraths. Glyph of Mass Exorcism for fighting multiple targets. Minor: Mostly just cosmetic. Take whatever you like. Glyph of the Righteous Retreat – A better bubble Hearth. Glyph of Winged Vengeance – Because 4 wings are always better than two. In Warlords: Hit, Expertise, Resilience, PvP Power, and Reforging are all dead. You have two new stats, Versatility & Mastery. You have an “attuned” stat, Mastery, from which your Righteous Vengeance gives you +5% Mastery from all sources. The value of the secondary stats are all fairly close to each other, with crit falling off due to the PvP nerf. Strength – everything you do is based off your Strength. Versatility is a direct add to all of your damage and healing and also to your damage reduction. It pretty much improves everything you do. It’s ranked high primarily for its defensive contribution. If you just don’t need the defense then you might rank it lower. Mastery gives all of your “workhorse” strikes (and their Multistrikes) additional damage. It’s a simple, straight up, damage increase to your most used strikes. Haste speeds up everything you do and reduces cooldowns and any cast times you might have. A Haste build (Haste before all other secondary stats) will give you more frequent use of your abilities at the expense of damage. Multistrike gives you a chance for one (two in PvE) additional strike (or heal) off of any given action. Each additional hit is at 30% effect. The strikes that your Mastery improves also improves their Multistrikes, making this stat more valuable than Crit. Crit randomly does large numbers, but you have nothing that procs off it or that increases it, so it falls below the others. In PvP Crit does 150% damage, not 200% as in PvE. Stacking stats will be done with gems (not yet available,) enchants, and gear selection, now that reforging is dead. Only gear that is randomly created, such as from boxes that you win, has a chance to have sockets. Vendor gear does not. Yes, this means that there will be few, if any, sockets appearing on Conquest gear. For older gear, if you’re under 90: The item squish cut gems down a bit. What used to be 160 Int is now 10, for example. The new Prismatic gems are 35/50/75 points of Mastery or whatever. Older gems (Mists of Pandaria and lower) that used to code for Hit now do Crit, gems that had Expertise are now Haste. 75 point gems are expensive, 50s much less so, 35s are dirt cheap. You won’t lose much by dropping down one gem level. In Warlords the only items you can enchants (on gear over item level 600) are your rings, neck items, cloaks, and weapons. All of the enchants are for secondary stats, none are for Str. Enchant for Versatility on all, but weapons. 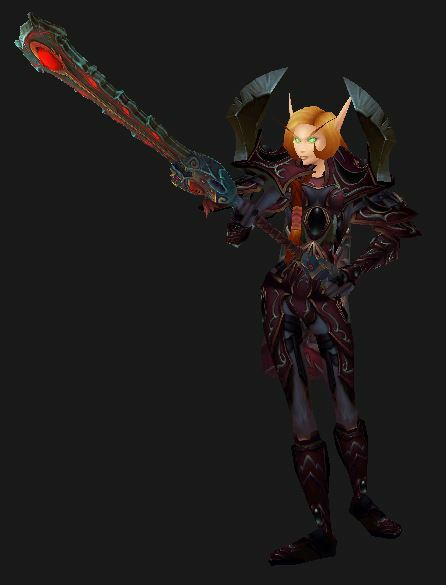 You might prefer the weapon bleed, for example. Truesteel Breastplate and Truesteel Greaves, upgrade to 685 with three Truesteel Essence and to 715 with 1 each of Mighty and Savage Truesteel essences. Steelforged Greataxe, upgrade this to 675 with 3x Steelforged Essence, and to 705 with 1 each of Mighty and Savage Steelforges essences. 640 Epic ring eventually becomes legendary. Honor and Conquest gear otherwise come from the vendors in Ashran. Honor weapons do not have any skill or special point requirement. Conquest weapons require 7,250 Conquest points to be accumulated first. There are two pieces available for each item slot, allowing you to adjust stats somewhat. By doing Ashran events you can gain rep with your leader’s faction which will eventually open up a third Conquest item, allowing more stat choice. If you don’t have at least the season 1 trinket pair, with its 15% damage reduction, consider getting that first. Then buy gloves and head or chest or legs, for the two piece bonus. Buy the “One Use” damage trinket. Buy neck, cloak, and rings and get them enchanted. Escape trinket, buy this first if you don’t already have one. This is a Skill-Capped video and covers how to quickly gear up in Warlords Season 2. It covers Ashran, BGs, Skirmishes, and the Coliseum. While it came out just before the season 2 started the info is still pretty good. An Ashran note: With 6.2 your are automatically assigned to a raid group upon entering Ashran. Sometimes that raid group will have a good leader and will be winning events, collecting lots of bones for your Sanctum, and harassing the other side. Other times… not so much. If you’re good at pulling a group together and getting it focused then do just that. You have events, rares, endless group PvP, killing the enemy boss, quests, and area objectives. Lots to do. 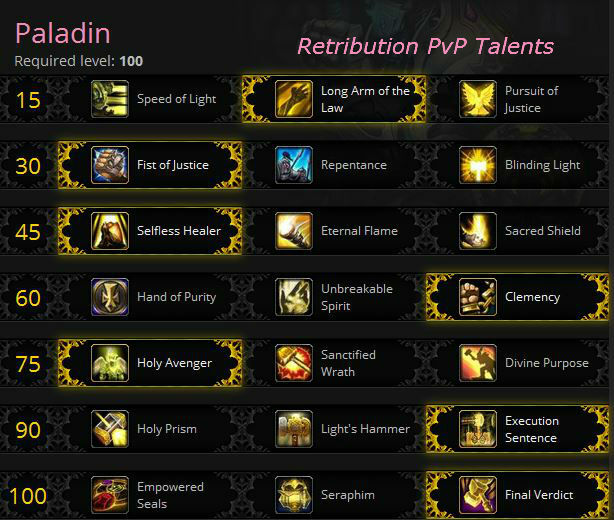 For lots more Retribution PvP goodness, check out Skill Capped. Note: If you took the Final Verdict talents then use that anywhere below where it mentions Templar’s Verdict. With your Holy Avenger talent each of your HP builders, while under Avenging Wrath, gives 3 HP, so you will be alternating the builder and the HP expenders. Exorcism should be used on cooldown. Your autoattacks have a chance to reset to Ex. cooldown and it should always be used when that happens. Hammer of Wrath should be cast whenever possible, either when a target is at 20% (35% with perk) health or when Avenging Wrath is active. Templar’s Verdict (Final Verdict) is your primary Holy Power using attack and should be used when you have 3 Holy Power unless you’re pooling Holy Power temporarily. With the Glyph of TV it also adds damage reduction, as does your Exorcism. Spammable abilities for general damage and to generate Holy Power. Hammer of Wrath is nice, but only when the opponent is 20% or less (35% with the perk) or when Avenging Wrath is up. So not really a “spammable” ability. Ranged abilities: Judgement, Exorcism, Hammer of Wrath, Execution Sentence or Holy Prism. They can also be used while disarmed. Hammer of Wrath – when opponent is 35% or less. Templar’s Verdict at 3 HP. You want to be using as many TV’s and Exorcisms as possible, for the damage and the damage reduction. PvP, being as dynamic as it is, requires you to take advantage of opportunities as they come up. Yes, Ret. Paladins can kite the enemy and close gaps. You’re far from being a Hunter, and your ranged shots aren’t long range or devastating, but you can do it. You will want lots of Haste for faster cooldowns. Glyphs: Glyph of Judgment (adds range, for kiting hunters & casters) or Glyph of Burden of Guilt (slow the enemy.) These two glyphs are exclusive. This guy covers stats, talents, very briefly glyphs, and rotations. He offers some pretty good commentary. It also has subtitles, but they’re so bad they’re funny. This one is 3×3 arena combat with a lot of very good commentary. The author doesn’t talk about talents, glyphs, etc., but does talk a lot about positioning, why this and why that, pressure, and a whole lot more. As he mentions, a lot of this applies to any class/spec, not just Ret. Not updated for Warlords, but most of the commentary on strategy and as such is pretty evergreen. This one’s by the same guy, but is for the Battlegrounds. Most of these were adapted from Vanguard’s Ret Page Startattack Use this basic macro with any attack that you might use to start a fight. It guarantees that your autoattack starts. WoG Macro: If you’re running 5s then you might have 4 of these, one for each party member. The only change will be party1, party2, party3, party4, corresponding to each party member. This way you don’t need to add their names to the macros. Focus Macros: use these for any abilities that might attack your focus target, such as Hammer of Justice or Rebuke. Arena macros are the same thing. You just use “arenax”, where ‘X’ is the number of the enemy, 1-5. This hammers the first enemy on your list. Since the Paladin is such a versitile class it’s hard to say which race is “best.” It really depends on what your game is. Humans might arguably be “the best,” at least for PvP, with their escape ability allowing two DPS/Healing trinkets. Blood Elves have the useful Arcane Torrent and Tauren have War Stomp, neither of which will be much use if you’re Holy. Heal: This is a tiny heal compared to the others you already have, so isn’t as useful as it is for others. Still, it requires no mana and no Holy Power, and is an instant cast. Stone Form: Nice against bleeds (Rogues, Ferals) and, as such, is definitely useful. Also comes with 10% damage reduction, which isn’t bad, at all. +2% to critical and healing effect. Human: May be the best Pally race for PvP. Bonus to Rep gains: Nice if you intend to gain faction with any of the many factions in the game. In the long run this may save you many hours of faction grinding. Every Man for Himself (Escape:) Very nice for PvP. It means that you don’t have to carry the PvP escape trinket and can grab a more useful trinket, such as one with a nice cooldown, instead. Arcane Torrent: Provides an A of E silence, once you get in range. Also restores a small bit of mana. Resistant to magical damage: Of small use against magic throwing things in raids, not so much elsewhere. Best Horde Pally race due to War Stomp and their increased health. War Stomp stuns nearby opponents – which is always useful. Increased Health – It’s the equivalent of at least three Stam gems. Hebalism skill and speed increased – The heal obtained from herbalism also adds a big Haste cooldown, which is pretty nice for you, since haste is your #1 secondary stat. Target of a wide variety of Man/Cow jokes. Paladin leveling is easy, regardless of spec. Holy can level in PvP or Dungeons, Prot in dungeons or questing (though a bit slowly,) and Ret crushes all opposition anywhere. But then you have those other alts you want to level though those 100 levels. What about them? 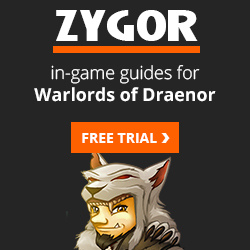 Zygor’s is an in-game guide and it nearly automates the whole leveling process: you just pick your starting point, at any level, and the guide tracks which quest you’re on, tracks the quest objectives, and automatically advances and updates as you complete your tasks and quests. In addition, a waypoint arrow is set automatically, so you never have to wonder where to go. All of the important quest info is included in the guide so you never have to wonder what to do. You’ll find that it’s vastly superior to the in-game questing help. Paladin leveling tips and what you need.